The Chinese Shar-Pei, also known as the Chinese Fighting Dog or simply the Shar Pei, is an ancient breed that has existed for centuries in the southern provinces of China. 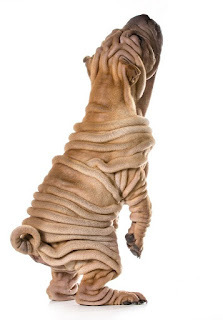 “Shar-Pei” literally translates as “sand skin” but more loosely means “rough, sandy coat” or “draping sandpaper-like skin.” In addition to their strange wrinkled appearance, they have a characteristic solid blue-black tongue, a feature shared only with another ancient Chinese breed, the Chow Chow. 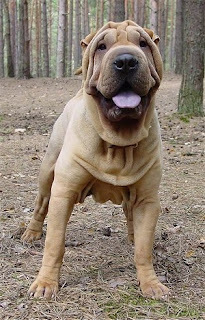 The Chinese Shar-Pei was recognized by the American Kennel Club in 1988 as a non-sporting dog and fully approved in 1992. 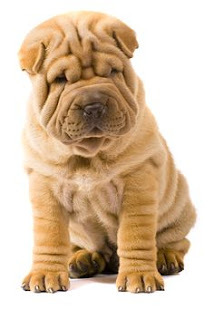 The average Chinese Shar-Pei stands 18 to 20 inches at the withers and weighs between 45 and 60 pounds, with females typically being smaller than males. Their extremely rough, short, wrinkled coat is unique to the breed. It should be neither shiny nor lustrous and comes in solid colors and sable. It should be brushed regularly, and the folds of skin should be cleaned and checked frequently to avoid moistness, irritation and infection. Shar-Peis are compact and sturdy, and they normally do not bark unless they are threatened or feel the need to alert their owners. The name Shar-Pei means "sand-skin" but translated more as “sand-paper-like coat.” No other breed shares the short, rough coat of the Shar-Pei. A Shar-Pei is a poor choice for a novice dog owner. A Shar-Pei housetrains earlier than most breeds because of his natural cleanliness and ease of training. The Shar-Pei enjoys and does well in obedience, agility, herding and tracking. He would rather be with people than other dogs. Those famous wrinkles need to be looked after carefully to prevent skin infections. They should be wiped out with a damp cloth and dried well to prevent infection. Like other flat-faced breeds, the Shar-Pei can easily overheat. 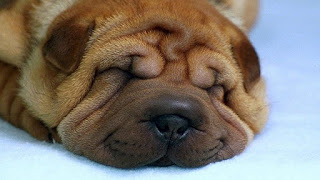 The large head and wrinkled face of the Chinese Shar-Pei has oven been compared to the head of a hippopotamus. They are independent and willful dogs, but when exposed to confident, consistent leadership are respectful companions and clean housemates. Their ever-present scowl coupled with their alert nature, makes them an imposing looking guard dog. The Shar-Pei's tenency toward independence them good companions for single people or working families with older children. They don't require much attention or exercise to keep them happy, and can entertain themselves with lots of chew toys or sun to bathe in. The Chinese Shar-Pei, which has an average lifespan of 8 to 10 years, suffers from minor health issues like lip and skin fold pyodermas, otitis externa, hypothyroidism, patellar luxation, allergies, and amyloidosis, and minor problems such as entropion and canine hip dysplasia (CHD). To identify some of these issues, a veterinarian may run hip, eye, knee, elbow, and thyroid tests on the dog. Megaesophagus is sometimes seen in this breed. 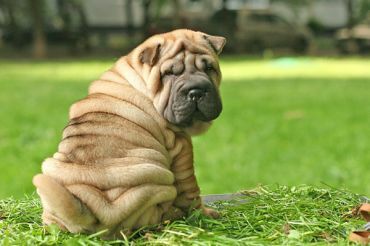 The Shar-Pei is also prone to fevers, and although its cause is unknown, it often occurs with Shar-Peis suffering from swollen hocks . The proper training and socialization of a Chinese Shar-Pei from a young age is very crucial in its development. Because it can have a higher propensity to territorial aggression and can be a little worried around strangers, it should get used to the idea of other humans and should be able to realize that being around them is safe. Training will also require a good degree of patience. If you’re a first-time dog trainer, the Chinese Shar-Pei is not the ideal dog to “cut your teeth” on. 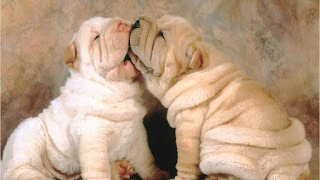 Despite their large size, the Chinese Shar-Pei does not need a lot of vigorous exercise to maintain good health. Several walks a day will suffice, making them good city dogs. It is recommended Shar-Peis, despite their watchdog capabilities, not be raised on a farm. Their natural instinct to hunt means they can take off into the wild blue yonder after deer or other wild animals. Grooming requirements depend on the individual Shar-Pei. 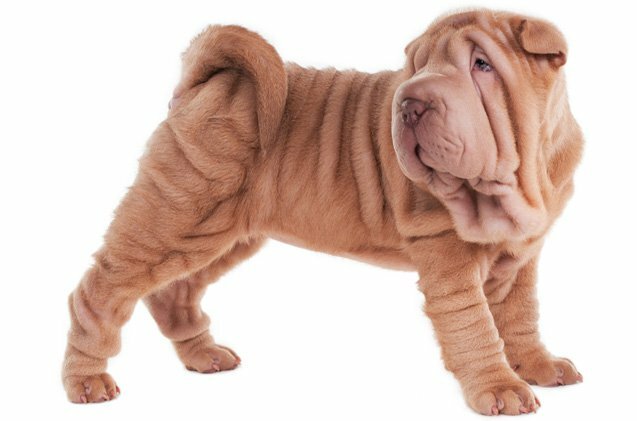 Weekly brushing can meet the needs of both the “horse-coated” variety and the “brush-coated” type , but some Shar-Pei of either type can be prone to skin problems. Shar-Pei with skin problems may need weekly bathing and daily brushing. All Shar-Pei need regular wrinkle care. The wrinkles must be wiped out with a damp cloth and then dried thoroughly to prevent infection. Do not oil the skin. 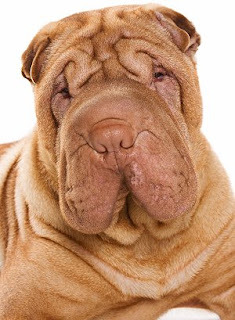 Shar-Pei have small, tight, triangular ears that predispose them to chronic ear problems because there isn’t enough air circulating in the narrow ear canal. Although it’s not as easy to clean the ears of a Shar-Pei as it is for most breeds, regular cleaning should be done to help prevent recurrent yeast or bacterial infections. Bathe the Shar-Pei as you desire or only when he gets dirty. With the gentle dog shampoos available now, you can bathe a Shar-Pei weekly if you want without harming his coat. The rest is basic care. Trim the nails as needed, usually every few weeks. Brush the teeth for overall good health and fresh breath. A good guard dog, the Shar-Pei does not require much space, making him a great fit for apartment life. For exercise, a daily walk will suit this pet just fine. Doing well with children and cats if raised with them, this breed bonds well with any and all immediate family members. Aloof and rude to strangers, he will need to be socialized well. In need of a dominant master, the Chinese Shar-Pei requires a good leader to avoid any untoward behavior. A clean breed, he doesn't shed often and requires only brushing and regular bathing. After teetering on the brink of extinction, the Chinese Shar-Pei made a comback: in 1983, the Neiman Marcus catalog chose the dog as its his-and-hers fantasy gift, offering a pair of Shar-Pei puppies for $2,000 each. A simple breed, the Chinese Shar-Pei will be happy to wake up in the comfort of his own home, surrounded by family members. Enjoying a nice, brisk morning walk, the Shar-Pei will return ready to guard his home from any possible dangers or strangers. Partaking in a bit of play and yard-romping, the breed will end his day sleeping at the foot of his master.